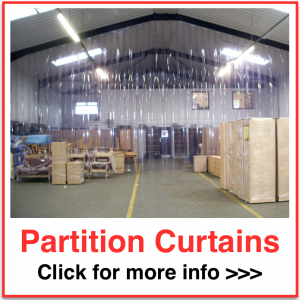 Sliding strip curtains are ideal for commercial and industrial locations where totally clear access my be required from time to time (e.g. loading bays or vehicle exits/entrances). 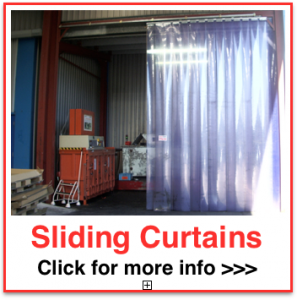 The strip curtains are mounted on a manually operated sliding track rig that allows all or part of them to quickly and easily move sideways out of the way. 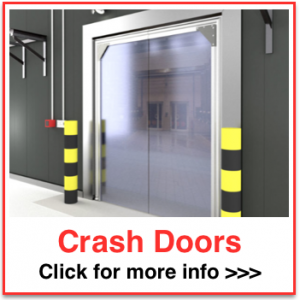 They can be mounted on single or double track set-ups to cater for just about every kind of door location and clearance requirement. NOTE: The sliding sections don’t compress, concertina or bend around corners like a fabric curtain can. They move is a simple left or right direction as a panel section (like a barn door). So there must be clear linear space left or right for them to move across into. Simple and quick to use. Full or partial sliding options available. 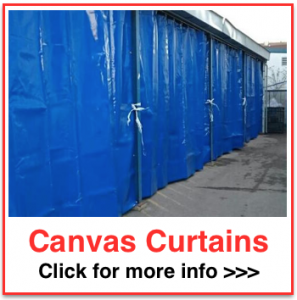 Takes any size or type of PVC strip curtain format. Replacement PVC strips available.